Design-build construction firm Ramtech Building Systems of Mansfield, Texas has announced that the company has completed work on the first of two 2,400 square foot permanent modular buildings to be used as pre-owned sales centers in Harlingen and Edinburg for South Texas-based Payne Auto Group. Ramtech will also use permanent modular construction to build two 3,828 office and showroom complexes for the dealership's Mission and Brownsville Mitsubishi dealerships. Design-build construction firm Ramtech Building Systems of Mansfield, TX has announced that the company has completed work on a new 2,400 square foot permanent modular building for Payne Auto Group. The prefabricated building is the first of two facilities that will be used as pre-owned sales centers by the South Texas-based auto dealership. The recently completed facility is located in Harlingen, Texas while the second building will be installed at the dealership's Edinburg location. Both buildings will utilize a combination of wide-flanged steel and HardiePanel vertical siding for the exterior. The Harlingen facility has eight offices with a 900 square foot open area in the center of the building. 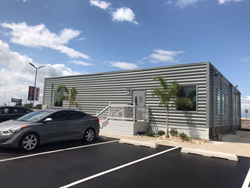 After consultations with the client after the completion of the first modular building, Ramtech helped to value-engineer the Edinburg complex to incorporate 10 offices and a larger 950 square foot open area in the same 2,400 square foot building footprint. Ramtech expects to have the Edinburg facility completed in October. During the month of September, Ramtech will also manufacture two 3,828 square foot facilities that will be used by Payne Auto's Mitsubishi dealerships in Mission and Brownsville, Texas. Both of these facilities are designed to include seven offices with a large open area including a showroom capable of parking two to three cars inside the modular buildings. These prefabricated structures will use Ramtech's traditional permanent modular construction which will incorporate a concrete stem wall and grade beam foundation system along with a reinforced floor in order to handle the additional weight loads of the autos. Ramtech expects to have both of these facilities operational by the end of the year. Since 1982 Mansfield, Texas-based Ramtech Building Systems has been providing innovative permanent modular construction and relocatable modular buildings to educational institutions, government agencies, healthcare providers, and Fortune 500 companies throughout the Southern United States. As a design-build construction company, Ramtech offers full in-house design, a manufacturer direct product, and complete site construction services all within a single-source provider solution. By emphasizing a value engineering approach, Ramtech has successfully completed over 3,500 total projects of diverse sizes across multiple industries. Their school project portfolio includes both relocatable buildings and facilities built using traditional pier and beam permanent modular construction and the companies flagship Accelerated Building System slab-on-grade permanent modular construction. For more information, visit the company's website at RamtechModular.com.